Image - From Playful Petals stamp set. 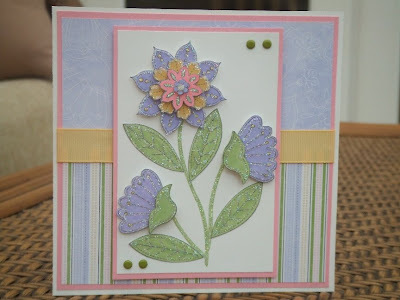 All stamped onto Whisper White cardstock and coloured with the Stampin' Markers. Accessories - Old Olive Brads, Dazzling Diamonds Glitter and So Saffron grosgrain ribbon (not available yet in the UK). You have really aced the challenge In my opinion. I am always in awe of your talent! And crazy about this card. It's extra gorgeous. I haven't gotten this set . Now I HAVE to have it. Your card is totally fab! Gorgeous! You've done a beautiful job here, it's just so pretty! Absolutely gorgeous Teri - I can see that it must have taken ages, but it was all worth it. Beautiful work. How lovely is this?! Soooo gorgeous, I love the soft colour palette. Utterly superb, and all that hard work you put into it has paid off, with your fave five spot this week, woooohooooo well done you!! Gorgeous card Teri, the colours are so pretty.